If you are looking for some sort of magic then this is not the page. The Driver Stage is straight out of EMRFD with just a couple of modifications. The big change are the devices where I substituted a 2N2222A for the 2N3904 to facilitate the use of a heat sink. The 2N2222A is a metal can TO-18 sized device and therefore can be fitted with a real heatsink. The output transistor is a BD139 which is a lot cheaper than a 2N3866. BUT --get a name brand BD139 like Fairchild or On-Semi. 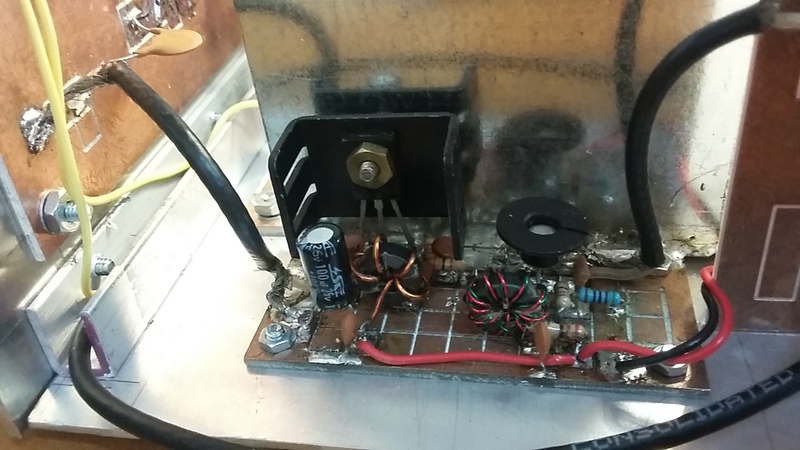 I changed the emitter resistor on the BD139 to 1.5 Ohms @ 1/2 watt. This gives more output! I have seen 400 Milliwatts from this stage. One other change was the bypass on the collector of the BD139 was changed to 100 Ufd at 50 VDC in parallel with a 100NF -- so there should be two caps installed. BIG Caution --the pinout for the BD139 is different!!!! !